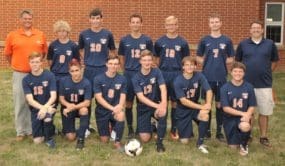 WILLARD — The Galion Tigers boys soccer team saw their first season come to an end Tuesday night in sectional tournament play against the Willard Flashes. Willard’s season continues after defeating Galion 8-0. The match started well for the Tigers. With first-team, Mid-Ohio Athletic Conference athlete Stephen Thompson at the goal, Galion finished off the first half down just 1-0 to the Flashes. Thompson had 12 saves in the half, but found himself sidelined for the second half after taking a knee to the side of the face. His injury changed the complexion of the rest of the game for the Tigers squad. Galion was unable to get things going for the rest of the game and their season was over. “I wish this one was different but sometimes things don’t work out,” said coach John Stewart of the final game’s outcome. In addition to Thompson’s first team all-conference honors, Matt Sparks was named to second-team MOAC team and Lucas Connor earned honorable mention honors. The team will lose six seniors after this season, which will leave a lot of weight to be picked up by the underclassmen in season number two next fall. “It was a good season with a great group of guys,” Stewart said. “The team made it through the season with relatively few injuries. We had fun along the way and learned some things about soccer. We also grew as individuals, and as a team, throughout the season. I’d consider it a successful season.